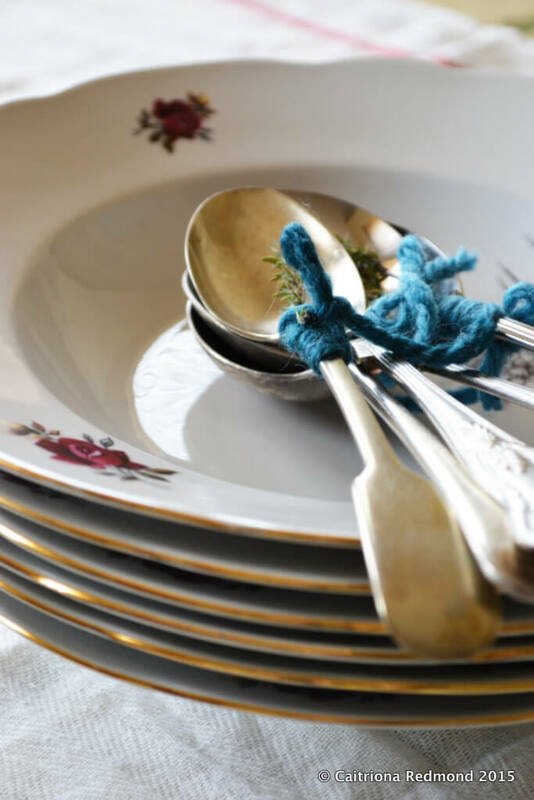 When I was doing up my meal plan this week I realised that sometimes I neglect to share the older recipes; the ones that have been in my family for generations. Irish stew is one of those dishes that I see on the menus of restaurants on the tourist trail but I would rarely order it while dining out. Not because it’s ‘peasant food’ but more because I can cook it so easily in my own home. I’m often disappointed by traditional Irish food when I eat at a restaurant. There’s no need to add too many extra ingredients or tweak a recipe much. Irish stew is hearty, made with a few simple (and frugal) ingredients; it is a perfect bowl of comfort food. It’s warming, nutritious, and uncomplicated. Less is more. As I’ve mentioned before, there is quiet efficiency and frugality in traditional Irish food. The trick to making a great Irish stew is to make sure that you cut the vegetables in the right way. Remember this is a slow-cooked meal so if you’re not careful you’ll end up with a giant bowl of (albeit very tasty) mush. Onions should be sliced from top to bottom, not in rings or small cubes. Carrots need to be chopped into chunky rounds, about 1cm-2cm thick, or left whole. Use the largest potatoes you can find. Peel your potatoes only, don’t chop them. This will keep the potato starch from overpowering the stew and the resulting ‘sludge’ that can be unappetising. You’ll instead have intact potatoes and a thin broth. Take a large heavy bottomed saucepan or casserole dish (make sure you have a lid that fits on top) and place on a medium heat. Allow to come to temperature before placing the lamb chops straight into the bottom of the pan. Yes, I know it’s ungreased but lamb chops are fatty and you will use the fat in the meat instead of an oil. Once the chops have become dark brown underneath, turn so that you get the same colour on the other side. Add in the vegetables (onions, carrots, and potatoes) then pour over the hot water so that the contents of the saucepan are just covered. Stir mixture a little to loosen the pan juices from cooking the lamb. Add in a sprig of thyme here if using. Stir in approximately half a teaspoon of decent salt and add a good few cracks of black pepper. Cover the saucepan/casserole and simmer as low as you possibly can for 2 hours. It should be a very slow bubble, not a fast boil. After 2 hours the meat should be tender and falling away from the bone. Remove any bones from the mixture, and the sprig of thyme before serving. Adjust the seasoning if you need to. We eat Irish stew from a soup-bowl with a spoon so that we make the most of the broth. You can of course strain away the ingredients and leave the broth for another day. If you’d like more vegetables in this meal, why not stir in finely shredded cabbage or kale before serving? It’s not exactly part of the classic recipe but they are a nice inclusion. I’ve noticed that a couple of Irish stew recipes recommend using lamb or vegetable stock in the cooking process. This isn’t authentic, as many years ago it would be unusual to have stock lying around to cook with. In fact, the broth left over from making Irish stew was frequently used for lunch the following day. The most traditional of recipes use water only. 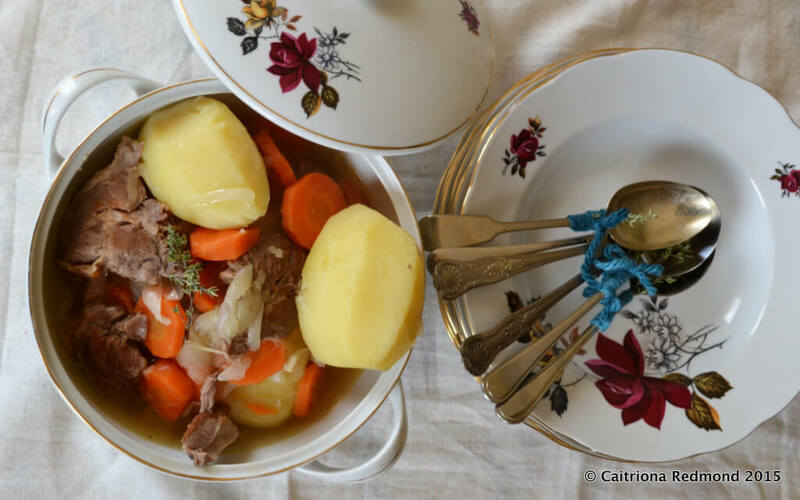 That’s not to say that you shouldn’t use stock, but if you’re looking for the most authentic Irish stew recipe then that’s what you’ll find here. Can you substitute beef for the lamb? My kids won’t eat the lamb. Thanks! I live in the United States. My mother, grandmother and even greatgreat grandmother (who lived with my family when I was a child) substituted a beef roast cut for lamb following nearly the exact same recipe. Hello I am a culinary student and planned to use this recipe for my project in class and was wondering your opinion on whether to add rosemary, turnips and or parsnips but i wasn’t completely sure. Thoughts? Also I am aware many people dont necessarily care for onions and if I were to not to include them do you think it would effect the flavor and authenticity of the dish? Hi Richard, if you read the blogpost I’ve explained that this is an authentic recipe. 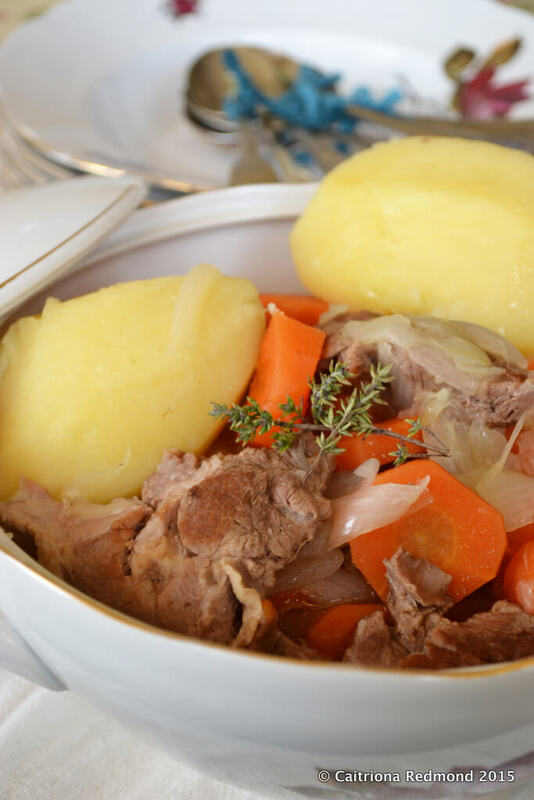 If you add these other ingredients then it is not authentic and not a classic Irish stew.